Women search, search, and search - spending up to 76 days of their lives on average searching for things in their handbag. SOI puts an end to searching in the dark. SOI springs to life - lighting up as soon as it senses an approaching hand. And switches off again once a given time period as elapsed. SOI means finding, not searching. 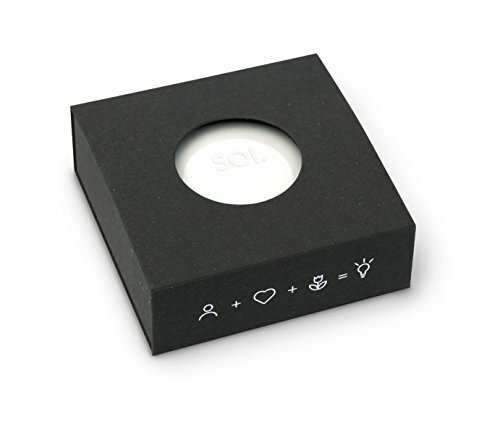 SOI cleverly uses special sensors which react to certain patterns of movements and hand gestures, this means SOI needs no switches, which need to be found in activators in the dark. At just 99 grams, SOI takes up very little space. But it’s still powerful enough to provide plenty of light. Thanks to high quality LEDs and optimized electronic circuitry, SOI is highly energy efficient, it just beams and beams! And after approximately 3000 cycles (turning on and off), the batteries can be easily replaced. SOI — the first automatic handbag light in the world. AN EVERYDAY ESSENTIAL FOR EVERY WOMAN - Every woman has a purse and/or handbag, and every woman knows the struggle of finding keys, cellphone, lipstick or anything in her bag! The SOI bag light is perfect for any handbag, tote bag, purse & backpack. FIND ANYTHING IN YOUR PURSE EASILY - A study shows that on average, a woman spends 76 days of her life searching in her bag. This is valuable time that the SOI handbag light can help you put to better use. Stop searching, and start finding. ACTIVATE THE LIGHT BY MOVING YOUR HAND - Simply put: an approaching hand (or a light tap) makes the SOI light up. The proximity sensors utilize energy fields from your hand to activate the light without the need for any buttons or switches. AUTO TURN-OFF, NO BUTTONS/SWITCHES - Once the SOI is lit, the light remains on for 10 seconds before turning off automatically. The sensor-driven technology makes switches, buttons & cell phone lights obsolete. Just wave your hand to turn it back on! ALSO CAN BE USED AS A BED AND TRAVEL LIGHT - Save battery on your cell phone: instead of using the flashlight function, leave the SOI by your bedside as a lamp or nightlight. It is small and lightweight, so take it with you anywhere while traveling! If you have any questions about this product by Brainstream, contact us by completing and submitting the form below. If you are looking for a specif part number, please include it with your message.